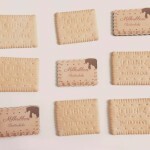 Milkribbon is a new indie brand from Germany that currently specializes in cut wooden pins. 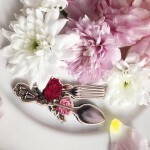 Per their website they “are inspired by folkloric European myths, traditions and a modern Marie Antoinette attitude”. 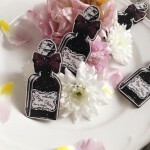 A bit ago they held a contest where they offered two of their “Misako” Brooches in pink; one for the winner and one for their “partner in crime” so to speak. 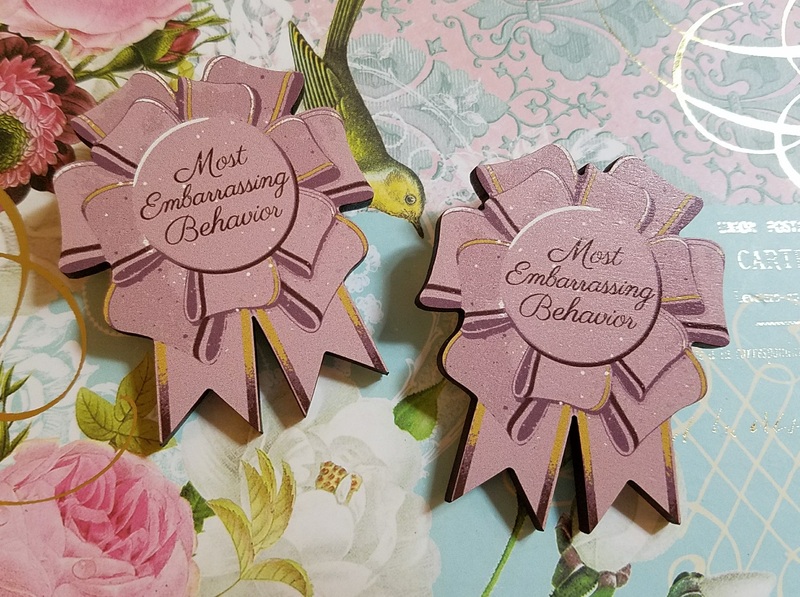 Everyone was invited to tell a story about how they and a friend got up to “most embarrassing behaviors”. The winners were picked randomly, and I was super surprised to find out that I had won a set! They have a matte finish and are beautifully detailed. The artwork perfectly mimics a metallic sheen on the ribbon edging, thought it’s actually solid print. The sides are stained a darker shade of brown, and the backs are raw wood with a pin. There is no chemical or ink scent to them; they actually have the very faintest scent of wood, which is really refreshing. There is a slight wood texture under the printing, which gives even more depth to the image. 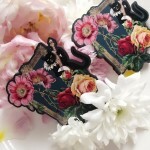 The pins are much smaller than an actual rosette, though certainly large enough to stand out! They retail for €16.99 and come in three colors; the dusty rose shade I won in the contest, a black with blue shading and a white with red, burgundy and gold shading. 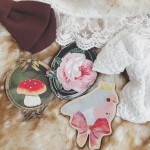 There are a number of other brooches in their shop right now, though some of them are not yet available or sold out already. The bottle says “Boy’s Tears” on it and is especially cute. The Boy’s Tears bottles will be on sale for a final preorder starting on Saturday May 13th. 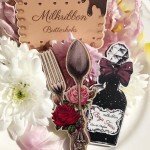 According to their Facebook, a number of their brooches will be restocking early this month, so be sure to follow @milkribbonshop on facebook to catch the release dates if you are interested!